E3 2018 should be a good show for fans of Dark Souls developer From Software. We’ll probably be learning more about their next big project, Shadows Die Twice, but we may also be getting an announcement regarding a very different sort of From Software game – Metal Wolf Chaos. For those unfamiliar, Metal Wolf Chaos was released exclusively on the original Xbox in Japan in 2004 and has never received a Western relese. That may be because it’s completely nuts – the game takes place during the second American Civil War, and you play as Michael Wilson, the George W. Bush-inspired President of the United States. You’ve been usurped by your vice president, who looks like Robert Trujillo from Metallica, but that’s okay, because you have access to a giant mech called Metal Wolf, which you use to retake America by force. No, really. This is the kind of stuff From Software made before they stumbled onto the Dark Souls formula. That take on the Presidential Seal is used in Metal Wolf Chaos. Devolver already hinted back in 2016 that they may be interested in doing something with the game. @senden_ogu Give us a shout, we’d love to talk about Metal Wolf Chaos! 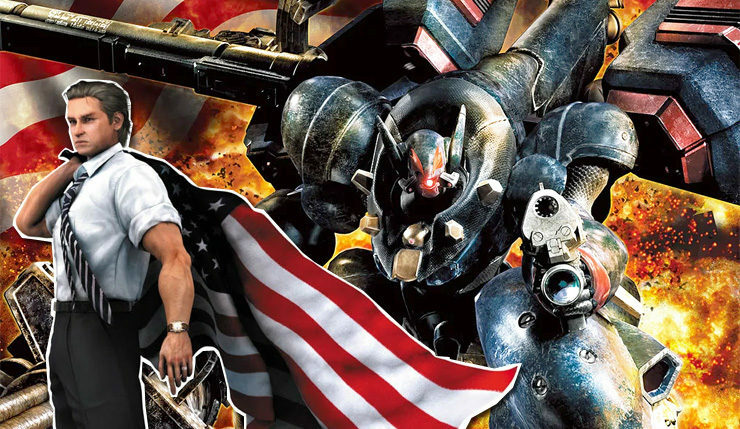 So, are we getting a Metal Wolf Chaos remastering or remake? Or just a budget-priced straight port? Whatever’s happening, the game should be a fun addition to Devolver’s E3 presentation. What do you think? Excited to try out this remnant of From Software’s quirky past? Or are you far too serious a gamer for such foolishness?